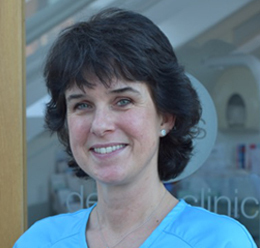 Liz studied Dentistry at Guy’s Hospital and after qualification in 1986 she spent a year as a vocational trainee in a highly regarded family practice in Tunbridge Wells. During the next few years she worked in two family dental practices in West Sussex, gaining valuable experience in all areas of general dentistry and formulating ideas for her own family orientated dental clinic. Andrew and Liz established the Mews dental clinic in Godalming in 1991 with the aim of providing high quality dental care and service to the local community; something they remain very passionate about. The practice continues to evolve and she enjoys striving with her dental team to make it the very best that she can for patients, so that they can have the treatment and service that they deserve. Liz enjoys treating patients and their families over the years, often spanning a number of generations, and achieving healthy beautiful smiles together.She gains great satisfaction helping those patients who are rather anxious of their dental visits, by providing them with personal dental care in a calm and relaxed manner. Continued professional development is of paramount importance to Liz enabling her to gain knowledge and develop further skills for the benefit of her patients. By regularly attending courses and as a member of the British Dental Association and British Society of Restorative Dentistry, she is able to achieve this. Andrew and Liz live in Godalming with their two daughters, and in any free time she has, Liz tries to keep fit with a little running and looking after her garden. She continues to be very proud of the dental clinic and team that she and Andrew have established and is enthusiastic about it’s future.